The GoPro HD HERO is where it's at if you're into any kind of "extreme" sport and you want to record high-quality HD video. With the included housing and mounting options, the HERO offers outstanding bang for your buck. ...you are an extreme athlete looking for a viable option to record some of your sweet moves in HD video. While the GoPro HD HERO may not be a brand new video camera, we here at Steve's finally got our hands on one. By far, the GoPro HERO is the most popular HD video camera used by athletes, racers, and other adventurous folks. This extremely compact unit offers some impressive features, thanks mostly to GoPro's rugged waterproof, shockproof, and even bombproof housing. While this unit is aimed more at capturing both Full 1080p and 720p HD video, you can also snap 5-megapixel still photos. All in all, the GoPro seems to be the go to unit for anyone looking for an extremely rugged HD video camera to accompany them on their adventures. Looking at the internals of the HERO, we find a 1/2.5″ HD CMOS image senor, which is mated to a fixed f/2.8 glass lens. This lens boasts a fish-eye type view, with the angle of view varying depending on the mode being used. At full, 1080p resolution, the angle of view is approx. 127 degrees. Switching to still photo mode or 720p, 960p, and WVGA video modes alters the angle of view to 170 degrees. Either way, you have an extremely wide view of the world around you; not necessarily just in front of you. The overall design of the HERO is straight forward and simple. It's basically a small square box, with a lens, a small data LCD on the front, an SD/SDHC card slot, and two buttons; that's it. There are no complicated or confusing controls, nor any in-depth menus. The data LCD is used for changing the capture mode, choosing the video resolution, and toggling some of the other possible settings (like metering for example). At first, the menu can be confusing; especially if you're like me and did not read the manual first. On the back of the camera, GoPro has printed a list of the different resolution settings, which are represented by the letter "r" and a number. Pressing the button on the front of the camera, just below the data LCD, will switch the between the capture modes, until you see "Set". Using the shutter release, you can then choose the setup menu, which is where you find the video resolution options, metering, etc. I highly recommend you have the fold-out manual with you the first time you start playing with the camera. After a few times of navigating the simple on-screen menu, you should have no problem memorizing the different options. With the GoPro HERO, framing your shot is not the first thing on your mind; in fact it's more than likely one of the last things you're thinking about as you're flying down the mountain side on a snowboard, or catching that big wave. Unfortunately, the HERO does not have a built-in LCD screen like you see on all digicams and most all video cameras. This may be a negative to some, however the idea behind the HERO is to mount it pointed in the general direction you want to record, and go. Due to it's wide angle of view, it's likely you'll get what you were hoping to capture within the frame. If you absolutely must have a LCD, GoPro does offer their LCD BacPac. This is a unique accessory that allows you to mount a LCD to the back of the HERO, and the LCD BacPac kit includes housing adapters or "backdoors" to extend the waterproof housing to fit the LCD screen (four backdoors are included). The size of the LCD looks to be about 2-inches, however GoPro does not list the actual specifications of this display. At only $79.99 US, I feel the LCD BacPac is worth the extra investment. On top of being able to frame your subjects better, you get additional functionality like a playback button, video and still photo playback options, a built-in speaker for audio playback, easier menu navigation, record mode and quality icons, as well as a battery level indicator. The only downside is that this LCD will decrease battery life a bit. How much? At this time we do not know since we weren't able to test the LCD BacPac with the HERO this go around. When wanting to capture still images, you have a three still image modes to choose from. You can shoot in a single drive mode, capture a 3-shot burst, or use an intervalometer type drive. In the latter mode, the camera will capture several images at a preset interval, which you set in the Setup menu. The interval starts when you press the shutter release, and stops when you press it a second time. You can choose to capture a photo every 2, 5, 10, 30, or 60 seconds. While the HERO is a HD video camera, it was nice of GoPro to offers various still image drive mode settings for you to choose from. Image quality from the GoPro HERO is decent, but nothing to get overly excited about. However, you have to understand this camera's soul purpose is to capture high-quality HD video in conditions that other video cameras don't dare enter without expensive aftermarket housings. The 170 degree angle of view in still photo mode gives you a fish-eye effect on all photos, which many might find displeasing. Luckily, a few seconds in any modern image editor can fix the distortion, and give you a nice wide and flat looking photo. While I personally would only be using the HERO for video, it is nice to have the option to capture 5-megapixel photos. While using the HERO, I did wonder if you'd notice any drop in image quality when the camera was in the included waterproof housing. GoPro uses a glass lens cover on the housing, which seems to keep the optical quality high. I didn't notice any major differences when shooting the same subject with and without the housing installed, however we did put samples taken with and without the housing on our samples page for you to compare as well. With my findings, I'm confident that the HERO can stay in the housing 100% of the time; there's no real good reason to take it out, as far as image quality is concerned. Now, to the video quality; since that's the main purpose of this camera anyway. The HERO really did impress us. While we mainly focus on still photos, we still look at a lot of video as well. Most all digicams nowadays records HD video, whether 720p or full 1080p/i. Most of those cameras record decent video, that is great for simple videos of family and friends. However, when compared to a digital camcorder, they are mostly sub par. The HD HERO on the other hand can capture some beautiful video, no matter which setting you are using. I think the quality lens GoPro uses helps with this quality. Playback is nice and smooth on my PC, and we saw very little noise in our videos. I only saw an "issue" in one of our videos where there was a white piece of paper off to the left. You could see some "ghosting" around the bright white object. I'm guessing this is due to the extreme contrast from the white piece of paper and the dark stump it was sitting upon. Other than that, I was very happy with the video quality from the HERO. GoPro includes some High Definition video cables with the HERO, which use the older RGB composite type plugs, along with the left and right audio plugs from the standard "RCA" type video cables for sound. I plugged the GoPro into my Panasonic plasma HDTV to watch some videos on there, and I ran into a small issue. I'm not sure whether or not it's the TV or the HERO that's having problems, but the video would start to playback, then the screen would go black with just a few seconds of audio following. After that, the camera would be locked up with "Tel" across the date LCD in the front. Unfortunately, I don't have another HDTV to test the HERO with, so this is something I'm going to have to investigate further at a later date. Battery life from the HERO was very acceptable. GoPro claims you can record up to 2.5 hours of video, however they do not note how many still photos can be captured. Considering there's no LCD screen (unless you picked up the LCD BacPac), the HERO's 1100 mAh, Li-ion battery has plenty of juice for a full day's adventure; if not a bit more. Obviously if you're filming the entire day, you'll run out of power after a few hours. However, if you're one who takes a few still photos on the hike up the mountain, then shoots video on the way down, you'll have enough power for several trips up and back. If you need even more power, GoPro offers their Battery BacPac. Like the LCD version, it mounts to the back of the HERO, and includes additional backdoors for the waterproof case. This BacPac has a second 1100mAh, Li-ion battery pack inside, doubling the HERO's battery life. Another benefit of the Battery BacPac is that fact that when it's not attached to the HERO, you can use is as an external battery charger to charge up any and all of you spare batteries. That way, you can ensure you have all the power you need for your next excursion. Not to shabby for a $49 accessory; and additional HERO batteries are only $19.99. Bottom line - GoPro has obviously hit a home run with their HERO HD video camera, as this is one of the most popular HD video cameras sold at big retailers like Amazon.com. 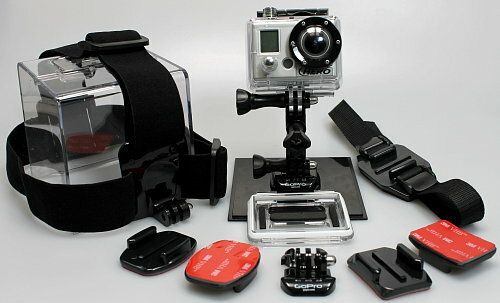 GoPro has various "kits" you can buy, like the HD Helmet version we used, as well as several handy accessories. You can also simply buy the GoPro HD HERO Naked kit, which just gives you the HERO, the awesome housing, and a few mounting points; you save about $40 this way. That said, we here at Steve's give the GoPro HD HERO a huge thumbs up for it's ruggedness and versatility for active users. Is the HERO for everyone; No. However, if you are in any extreme sport, whether you race AutoX, snowboard, surf, or skydive, the GoPro HD HERO is the camera for you. With a MSRP of $299 US for one of their three hits (Helmet, Surf, Motorsports), or $259 US for the "naked" kit, the HERO is well worth the investment. Many may think that's expensive, however when you factory in the amazing waterproof, shockproof, and even bombproof housing you are receiving, not to mention all of the mounting hardware, it's easy to see the value in these kits. If you love the HD HERO, but don't need to shoot 1080p much, GoPro now has their HD HERO 960. It offers all the same great features of the original HD HERO, minus 1080p video recording, and is about $179 US; the most affordable option of the bunch.